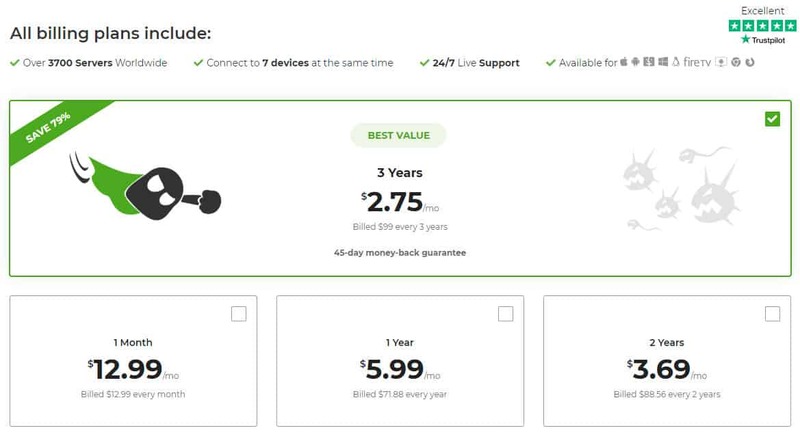 CyberGhost Review 2019 | Is buying this low cost VPN money well spent? CyberGhost Review 2019 – Is buying this low cost VPN money well spent? We’d recommend CyberGhost to beginners who are looking for a fast, reliable connection, an easy-to-use interface, and a decent selection of server locations. It's ideal for torrenters and those looking to stream. CyberGhost is a Romanian-based company that has undergone some major changes in recent years. Having been acquired by an Israeli (but UK-registered) company, Crossrider, it has gone through a rebranding phase. A notable effect of the transition is a renewed focus on providing streaming capabilities to users. Overall, CyberGhost offers an easy-to-use and reliable service at mid-range to low prices. There is also a 45-day money-back guarantee for the longer plans which is slightly longer than most VPNs offer. Let’s see what else this provider has to offer! On the CyberGhost pricing page, you’ll see the available packages. There are, as is usual with VPN providers, steep discounts if you opt for a longer term. The monthly payment pricing is $12.99 (GBP £9.98) per month. Then there’s a one-year option at $5.99 (GBP £4.60) per month, a two-year option at $3.69 (GBP £2.83) per month, and a three-year option at $2.75 (GBP £2.11 ) per month. Note: Comparitech readers can take advantage of this price on a three-year plan any time. The pricing page gives plenty of payment options, including credit card, PayPal, BitPay, and more. The acceptance of bitcoin will be welcome news to those wishing to pay more anonymously. So, what can you expect from this package? CyberGhost’s plan enables you to cover up to seven devices, and downloads are available for Windows, Mac, iOS, and Android. When it comes to browsing, you can also choose your server location, and the selection is adequate with over 1,100 servers in almost 60 countries. You can also tailor your browsing with additional features, such as ad blocking, automated HTTPS redirect, and data compression. You also have the option to access various streaming sites such as Netflix and Hulu, and the ability to download torrents anonymously. Getting started with CyberGhost is very simple. Once you log into your account, you can go to the My Devices tab where you’ll see spots for seven devices. Click Add a new device and download and install the app for whatever operating system you’re using. Once it’s installed, you’ll just have to log in using your account credentials. There’s no need to restart your device after installation. For the purposes of this review, we tested the apps for Windows 10 and iOS. When you select Surf Anonymously, you’ll have the option to choose your server’s location from a dropdown list of 27 countries. If you don’t make a choice, it will choose a server for you when you hit Start Anonymous Surfing. Before hitting that though, you can also choose to enable or disable (many are enabled by default) a list of features including Block Online Tracking and Extra Speed. Once you do start surfing, the dashboard will show you your server location, your replacement IP address, and time connected. You can also scroll across to find out info about ads, tracking, and malware blocked, as well as download volume and speed. If you want more choice when it comes to server location (the previously mentioned dropdown only allows you to select the country), then you can choose your precise server location by hitting Choose My Server in the main dashboard. Here you can view user load, torrent capability, and ping latency (which can indicate speed – lower being faster). You can also choose to view servers listed under various criteria, including most empty and fastest. While in this mode, if you want to apply the additional features, such as ad blocking and data compression, you can go to the Extra Features tab to see a set of options. 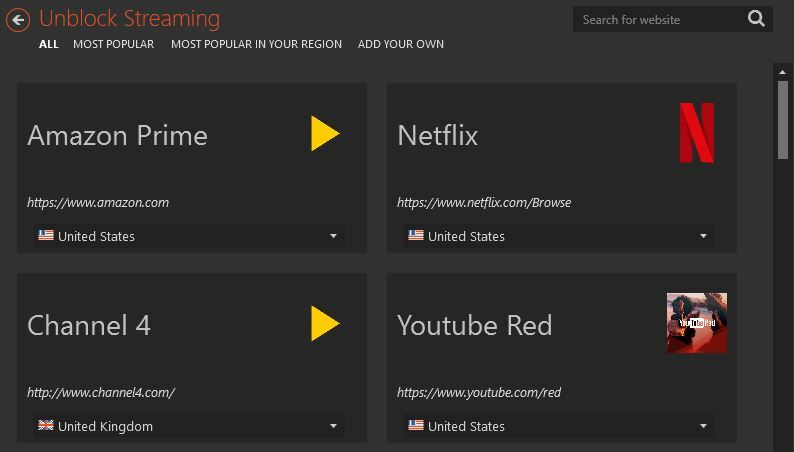 If you’re looking to unblock streaming, when you select this mode from the main dashboard, you’ll be greeted with a selection of streaming sites to choose from, including Netflix and Amazon Prime. Beneath each one, you’ll see the default server that will be used to access it. Some, such as YouTube, will have multiple server options in the dropdown for you to choose from. Additional modes include Torrent Anonymously, Unblock Basic Websites (such as Google, Facebook, and WikiLeaks), and Protect Wi-Fi. For more advanced features, including startup behavior, connections, and wifi protection, you can visit the Settings tab in the top right hand corner of the dashboard. Closing the dashboard won’t cause CyberGhost to disconnect and it will continue to run in the system tray. You can access it by right-clicking, and it will display a mini dashboard showing your server location, IP address, and session duration. It will also give you the option to disconnect or switch to a recently selected service. The mobile app, which as mentioned is available for both iOS and Android, looks quite a bit different from the desktop version at first glance. It opens to a slideshow of options, starting with Secure Wi-Fi, moving onto Secure Streaming, Surf Anonymously, and finally Choose My Server. There is also a menu button in the top left hand corner where you can manage your settings and access your account, as well as support if needed. However, once you’ve selected your service, your options are much the same as they appear in the desktop version. Just a note that it seems the only real difference between Surf Anonymously and Choose My Server (within the desktop and mobile apps) is that with the latter you get to choose the exact server you want to use. Both offer additional features such as ad blocking, as well as the option to simply connect using whichever server you’re allocated by default (if you decide not to choose). One neat feature in this app, which can be found in the Settings menu, is automatic wifi protection. Simply toggle this feature to the on (yellow) position and you’ll be automatically protected every time you connect to a familiar wifi network. You can also adjust the settings just below to dictate what happens when you connect to a new wifi network. Overall, this is an intuitive, well-designed app. It’s responsive, sleek, and easy to navigate. CyberGhost currently has over 1,100 servers in 59 countries. That’s a decent number with plenty of choice of locations. We were able to seamlessly stream 1080p video with no buffering while connected to servers in Canada, Germany, and the US (the three YouTube options offered) from the test location in Canada. We could also play online games without any noticeable lag. The connection didn’t drop at all while surfing, although it often took several minutes to connect to specific servers in the Choose My Server option. In the same mode, there were also some instances where a connection couldn’t be made on the first try. This wasn’t an issue in the Surf Anonymously mode, in which you simply specify the server country rather than its exact location. Therefore, it’s only really a concern for advanced users who are choosing the precise servers they want to connect to. While running our speed tests we try to be as empirical as possible. Using a test server in Canada, we connect to each provider’s servers in various locations (the US, the UK, Hong Kong, Australia, and Germany). A test file (50MB in size) is downloaded from a US server four times per day at six-hour intervals. This is repeated for each test server. We record the average download speed for each test and show the aggregate data in the interactive chart below. In the first Simple tab, you can see how CyberGhost compares to other VPN providers we’ve tested, on the basis of median download speed. Indeed, it’s one of the fastest we’ve seen so far. A more detailed version of our results can be viewed by switching to the Detailed tab. Here, you can see that the spread in results for CyberGhost is fairly tight compared to many of its competitors, indicating reliable speeds. 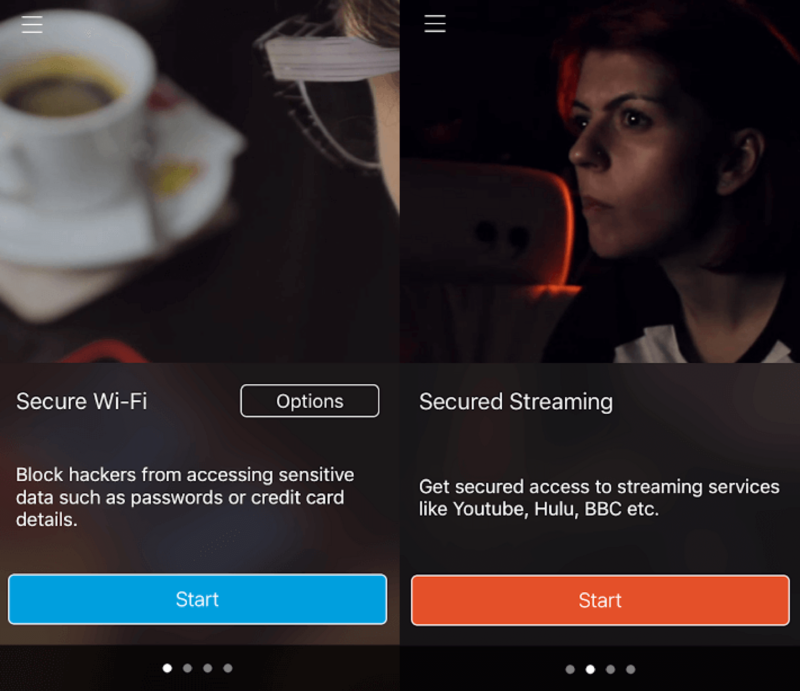 As mentioned, during its recent transitional period, a main focus of CyberGhost has been to improve streaming capabilities and the ability to access geo-restricted content. Most notable is its dedication to providing access to US Netflix for users across the globe. To access US Netflix, you can simply select Netflix in the Unblock Streaming screen. This will automatically connect you to an appropriate server and open Netflix in a new browser tab and enable you to view the entire US Netflix library. It’s worth noting that CyberGhost is focusing on US Netflix right now because that’s where it finds most demand is. As such, you might not have the same luck trying to access Netflix when connected to servers in other countries, such as the UK. We tested access to a couple of other streaming services with mixed results. For example, Amazon Prime Video worked fine through the automatically selected server. A notable omission from the streaming options is BBC iPlayer which has become difficult for many providers to offer access to. Indeed, CyberGhost is struggling with this and can’t currently unblock the BBC iPlayer content. You can use the Unblock Basic Websites option to bypass the Great Firewall of China. This means you should be able to access sites like Google, Facebook, and YouTube while visiting. However, there have been reports of it not working for some users, so it may be a case of trial and error. While CyberGhost was originally developed in Germany, the company later moved to Romania, a country in which there are no mandatory data retention laws. This is good news for users seeking privacy as personal data can only be retained if unequivocal consent is given. However, as mentioned earlier, CyberGhost was recently acquired by Israeli company, Crossrider, which is registered in the UK, a country that is subject to data retention laws. CyberGhost insists that it will continue to run as a standalone company based in Romania, and will therefore only be subject to Romanian law. So there should be no concerns here. CyberGhost doesn’t log user behavior, web targets, or communication. It keeps some connection logs but none that can be tied to an individual user. Payment and registration details aren’t logged and users are given an anonymous ID. 256-bit AES encryption is used on the OpenVPN protocol which is considered pretty much as good as you can get. This is in conjunction with 2,048-bit RSA keys and SHA256 authentication. When connected to a CyberGhost server, your IP address will be hidden and replaced by a VPN IP address. This will be shared by others using the same server as an additional layer of security, but with no chance for data cross-transfer. However, this feature may make it easier for sites like Netflix to identify and block VPN IP addresses. A kill switch is enabled by default, so all internet traffic is blocked automatically if the VPN connection is dropped unexpectedly for whatever reason. 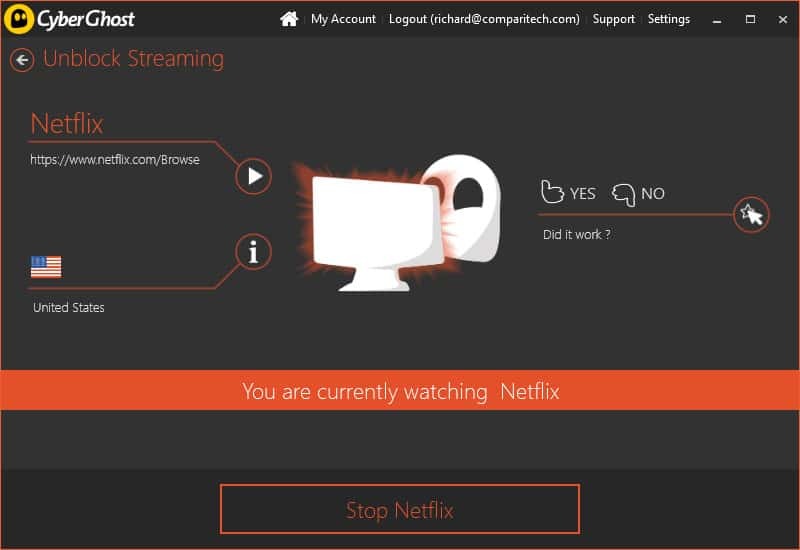 If this happens, you will have the option to continue browsing without protection or wait until the VPN connection is restored. Additionally, if you want to ensure that a particular app never runs without the protection of the VPN, you can use the App Protection option in the settings menu to specify it. CyberGhost automatically provides protection against DNS leaks, IPv6 leaks, and port forwarding leaks. You can block tracking while browsing so that sources using trackers will not be able to load content on the websites you visit. Additionally, the HTTPS redirect feature will automatically favor an encrypted connection if it’s available for the site you’re accessing. CyberGhost’s support page offers help in the form of guides, troubleshooting pages, and FAQs. If you can’t find what you’re looking for there, you can submit a request. Both of the requests we submitted were answered within 12-14 hours. Due to the time difference they would have been sent fairly late at night in Romania, but were answered the following morning. CyberGhost offers reliable and knowledgeable 24/7 live chat support. It is outsourced to Zendesk which may be an issue for more privacy-conscious users. In that case, submitting a request might be a better option. Overall, CyberGhost is offering an easy-to-use, fast, and reliable service. It has plenty of servers to provide you with options such as anonymous surfing, unblocked streaming, and anonymous torrenting. CyberGhost can provide access to geo-restricted sites, including US Netflix and Amazon Prime Video. Users looking to unblock other Netflix libraries and content from BBC iPlayer might be disappointed. This provider boasts strong security, DNS and IPv6 leak protection, and an automatic kill switch. Its support options mean you’ll always be able to get a quick, knowledgeable response.